Batavia, Ill. – April 7, 2016 – Residents in Los Angeles and Orange Counties will soon be able to experience a whole new way to grocery shop at ALDI, one of America’s favorite grocers. 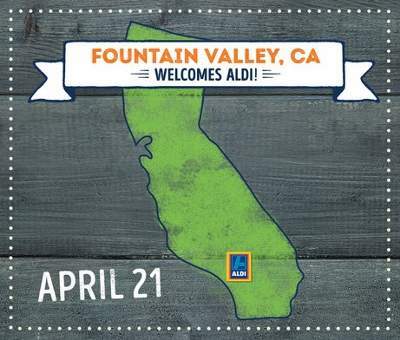 On Thursday, April 21, ALDI will open 10 new Southern California locations, six of which are in Los Angeles County, three in Orange County and one new store in San Bernardino County. The easy-to-shop food market takes a simple approach to grocery shopping that translates into big savings for ALDI shoppers. In fact, shoppers have found that switching from national brands to ALDI exclusive brands can save them up to 50 percent** on their grocery bill. The April grand openings are the next step in the grocery retailer’s plan to open approximately 45 stores in Southern California by the end of 2016, eight of which opened last month. The Southern California store openings play a significant role in the company’s strategic plan to expand to nearly 2,000 ALDI stores from coast-to-coast by the end of 2018. ALDI recently announced plans to accept credit cards – including Visa, MasterCard, Discover and American Express – at all of its stores nationwide. The move to accept credit cards is yet another way ALDI is making grocery shopping as simple and enjoyable as possible for its more than 30 million customers each month. 8:45 a.m. The first 100 shoppers to arrive at each store will receive a golden ticket redeemable for an ALDI gift certificate of various amounts, and all shoppers will be invited to enter an on-site sweepstakes for a chance to win Produce for a Year. Additionally, shoppers on April 21, 22, 23 and 24 will receive a complimentary ALDI reusable eco-bag, while supplies last. A leader in the grocery retailing industry, ALDI operates nearly 1,500 US stores in 33 states. More than 30 million customers each month save up to 50 percent** on their grocery bills, benefiting from the ALDI simple and streamlined approach to retailing. ALDI sells the most frequently purchased grocery and household items, primarily under its exclusive brands, which must meet or exceed the national name brands on taste and quality. ALDI is so confident in the quality of its products, the company offers a Double Guarantee: If for any reason a customer is not 100 percent satisfied with any ALDI food product, ALDI will gladly replace the product and refund the purchase price. 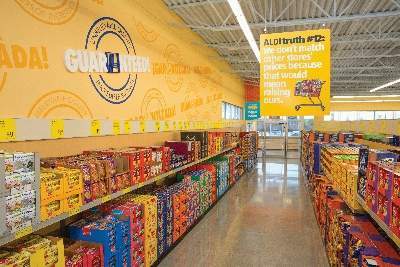 ALDI was honored with the 2015 Supermarket News Retail Achievement Award, recognizing the company for its ongoing business expansion and product evolution. For more information about ALDI, visit aldi.us.